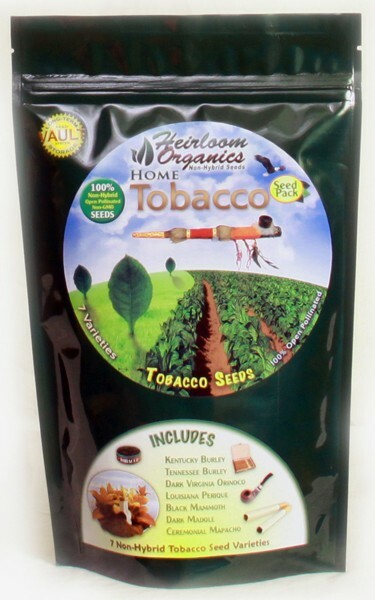 Smoking (Cigarettes, Cigars and Pipe), Chew, Snuff, Ceremonial and Medicinal tobaccos are all included in this pack of heirloom tobacco seeds, along with complete instructions on planting, maintaining, harvesting and curing your tobacco for use. Tobacco is also a very effective home solution for Pest Control. You can create a Tobacco Juice to spray around your plants as well as planting it around your garden to deter pests. Nicotine is the single most addictive substance known to man. Most everyone is unaware of the negative health consequences of tobacco use. Heirloom Organics does not encourage anyone to use tobacco, but we also do not condemn anyone who does use it. Growing your own will provide you with additive-free and pesticide-free tobacco.